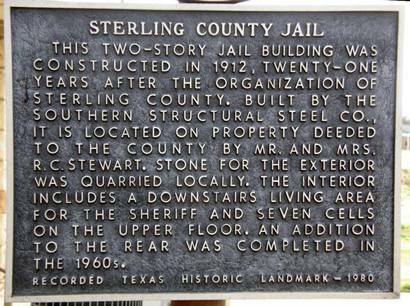 Sterling County Jail, Sterling City, Texas. 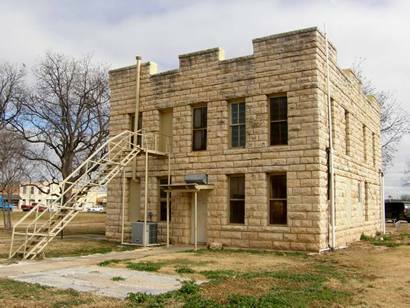 This two-story jail building was constructed in 1912, twenty-one years after the organization of Sterling County. Built by the Southern Structural Steel Co., it is located on property deeded to the county by Mr. and Mrs. R. C. Stewart. Stone for the exterior was quarried locally. 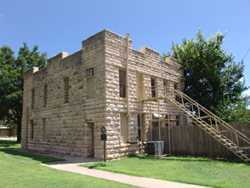 The interior includes a downstairs living area for the sheriff and seven cells on the upper floor. An addition to the rear was completed in the 1960s.